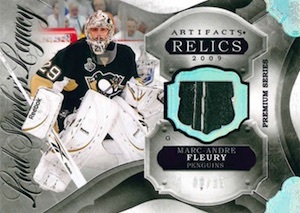 As in previous years, 2016-17 Upper Deck Artifacts Hockey stays true to its name with a focus on relics while other premium inserts are also available. 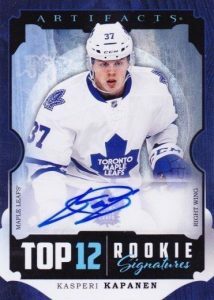 Boasting "big box-level value at a fraction of the price," each hobby box includes three hits and one rookie redemption. The standard base set is joined by the several popular subsets, including Rookies, Stars and Legends. Parallels grow the total options with Ruby, Emerald, Orange, Gold Spectrum and Black. 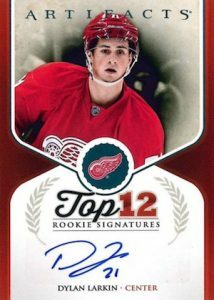 Another key aspect for collectors, Rookie Redemptions for the top 2016-17 prospects are again in play and average one per box. Available in several tiers and formats, two Autographed versions fall in every inner case. 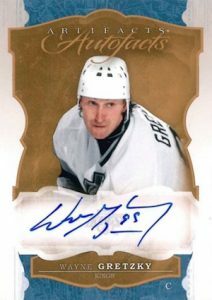 The rarest option is the one-of-one Black Foil Patch-Tag Autograph. 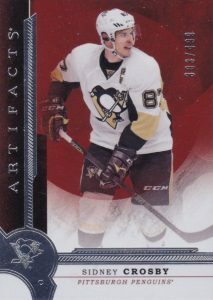 2016-17 Upper Deck Artifacts Hockey memorabilia cards include multiple themes. Led by Connor McDavid, Year One Rookie Sweaters includes jersey, patch, strap or tags from actual rookie-year, game-worn jerseys. Piece de Resistance takes a classy approach with a horizontal layout. A new insert for the brand and one of the potential box hits, Aurum is Latin for gold and the shiny cards make it clear why that name was selected. The 50-card set averages eight per case and the Gold Spectrum parallel falls 1:473 packs. 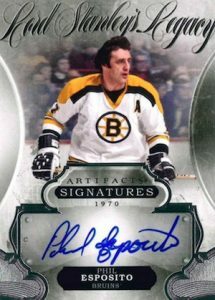 The popular insert line Honoured Members returns in 2016-17 Upper Deck Artifacts Hockey with game-worn Relics, on-card Signatures, and Cut Signatures. The Stanley Cup is another featured theme with Lord Stanley's Legacy Relics and Signatures. The insert honors those who have lifted The Cup. Pack odds key: h = Hobby, r = Retail, b = Blaster. 180 cards. Shop for complete base sets on eBay. PARALLEL CARDS: Ruby #/299, Emerald #/99, Orange #/55, Gold Spectrum #/25. 40 cards. 1:9 Hobby packs, 1:96 Retail/Blaster. 20 cards. 1:77 Hobby packs. PARALLEL CARDS (I-V Only): Silver - 1:422; Emerald - 1:854; Gold Spectrum - 1:2,788; Black - 1:41,824. 5 cards. 1:105 Hobby packs. PARALLEL CARDS: Emerald - 1:422; Gold Spectrum - 1:1,195; Black - 1:8,365. 161 cards. Serial numbered #/5. Some cards are signed. Autographed cards (A) noted below. 161 cards. *Cards #15,98,117,148,150,151,156,159 only found in parallels. Black - Base #/5, Stars #/3, Legends #/2, Rookies #/5. 105 cards. *Cards #5,150,151,153 found only parallels. Gold Spectrum - Base #/5, Stars #/3, Legends #/3, Rookies #/15; Black 1/1. 50 cards. 1:21 Hobby packs. PARALLEL CARDS: Gold Spectrum - 1:473. Overall Odds: 1:72 hobby, 1:1,000 blaster/retail. 24 cards. Specific group odds noted below. Overall Odds: Overall 1:32 h, 1:48 r, 1:80 b. PARALLEL CARDS: Spectrum Patch #/15 (*No Card #FA-RH), Silver Foil Patch #/5, Rainbow Foil Tag 1/1. 9 cards. Serial Numbered #/27. 8 cards. 1:140 Hobby packs. Specific group odds noted below. PARALLEL CARDS: Spectrum #/15, Silver Foil #/5, Rainbow Foil 1/1. *Card #LSLR-TS found only in parallels. 8 cards. 1:800 Hobby packs. Specific group odds noted below. PARALLEL CARDS: Silver Foil #/3, Rainbow Foil 1/1. 17 cards. Specific group odds noted below. Overall Odds: 1:48 hobby/retail, 1:80 blaster. PARALLEL CARDS: Spectrum #/25, Silver Foil #/5, Rainbow Foil 1/1. *Card #PR-EK only found in parallels. All subjects not included in parallels. View specific options with the full spreadsheet. 5 cards. 1:480 Hobby packs. Specific group odds noted below. PARALLEL CARDS: Spectrum #/10, Silver Foil #/3, Rainbow Foil 1/1 (*No Card #T4-FLA). *Card #T4-DAL found only in parallels. 8 cards. 1:80 Hobby packs. Specific group odds noted below. PARALLEL CARDS: Spectrum #/15, Silver Foil #/5, Rainbow Foil 1/1 (*No Card #RS-PB). Overall Odds: 1:480 Hobby packs. Aden Taylor � I believe it is the odds for anything at retail other than the blasters. Aden Taylor � Yep. That is the most obvious thing it applies to. 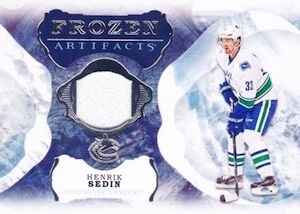 I just don’t know if there are any other retail formats for Artifacts other than blasters and standard retail boxes. I understand this is a lower end release, but the old 3 hits for $100-$125 model is wearing thin. So many single color patch cards in this product and never ending rookie redemptions. UD has lost its way and the hobby is losing because of it. UD for me now stands for ultimate disappointment not Upper Deck because every release now is disappointing to say the least. I would give this product a “0”, but lucky for UD, it’s not one of the choices. Annually one of the worst products released. You keep hoping it would improve, but no such luck. This could very well be the last box of Artifacts for me. This is a 4-5 stars for me. 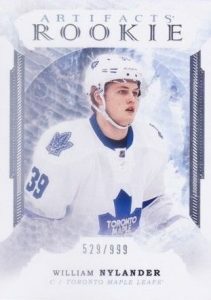 The product looks really nice and I love the design, especially for the rookie cards with the ice impression background. Comparing to the last year or to two years ago, this is really sweet. There are a lot of parallels to the base set, which is nice since it offers an extra challenge to collectors. The checklist set is quite cool because it’s divided into 4 categories and the stars, the legends and the rookies are serial numbered so it’s a bit harder to get. But all this is not new. It’s an Artifacts trademark. collection, as they did last year with Contours and Champs for example. I’m not saying that those collections were necessarily good, I’m just talking about the idea of innovating something. I know I like Artifacts as it is and I also know a lot of customers like it since it sells out every single year. They simplified the rookie redemption sets, which last year was very complicated and people didn’t understand all the parallels and the sub-parallels. There were a lot of complaints I guess and they realized that. Even now the set is a bit complicated to understand. As for the value of the cards, I believe they did a fair job. Sure, there are a lot of jerseys because this is a mid-end product, but I pulled a lot of very nice patches, a tag, a lot of nice signatures and a lot of low serial numbered cards. If one buys a box or two, it’s all about luck of course. I’ve watched a lot of case breaks and I believe this is a fair product in terms of value. Of course this is the collecting business and hobby. Once cannot expect to pull 2-3 1-of-1s per case. The main issue though remains the QC. I find so many damaged cards it’s unbelievable. And of course, many of them are High-End cards. I think that people get over criticizing now because of the crap UD pulled last year, especially with their High-End Products and the 2-3 fiascos such as Contours, SP Game-Used or Black. for me this is always an average product. 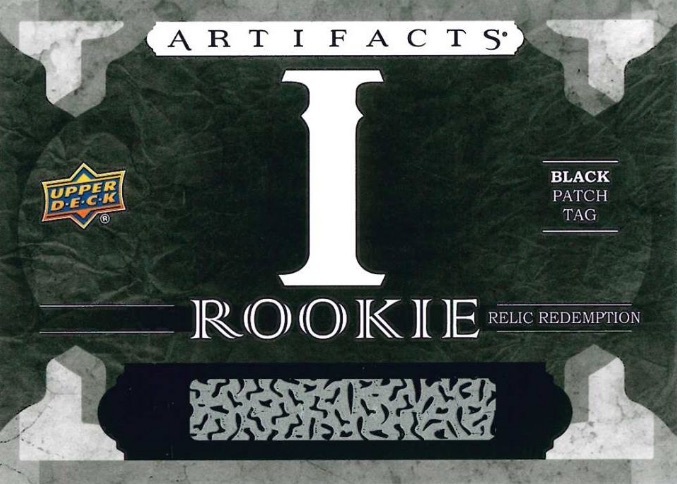 you buy artifacts for the rookie redemptions. there aren’t a lot of autos or greats patches to go around. I got two good redemption a silver auto # 1 and the Edmonton oilers. I like artifacts. I’m debating buying a few boxes and putting together the set through some activity on the forums sites, ebay and COMC. I’ve joined and spectated a few group breaks to get a sense of what opening a box or case is like. Honestly, it’s actually pretty good. 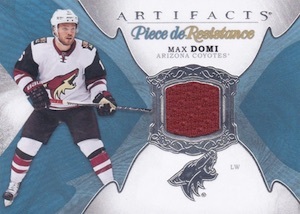 I consider artifacts as a nice step in the right direction after the disaster that was 15-16. I think the cards look great accross the board. I think the configuration is set-builder friendly (both in reasonable ease to accomplish and reasonable challenge to make it interesting). I think the parallels system is maybe a little bit too diverse for my tastes, but that’s an artifacts thing and always has been. I think one thing that makes the release cool is the diversity of hits. You really get a sense when opening a box of artifacts that anything can happen (versus a box of series 1 for example where 99.5% of the time you know exactly how many of each card type you’re getting). I like the excitement that brings. My biggest issue is actually the pack/box/price configuration. Artifacts usually sells between $110-125 CDN at release (and often goes down to about $90 after some time). This isn’t terribly expensive from a wider hobby perspective, but it’s still a significant amount of money for only 8 packs of cards. I think they should bring it back to 10-12 packs and leave the insertion rates exactly as is to make opening a box feel a little more worth the money spent. 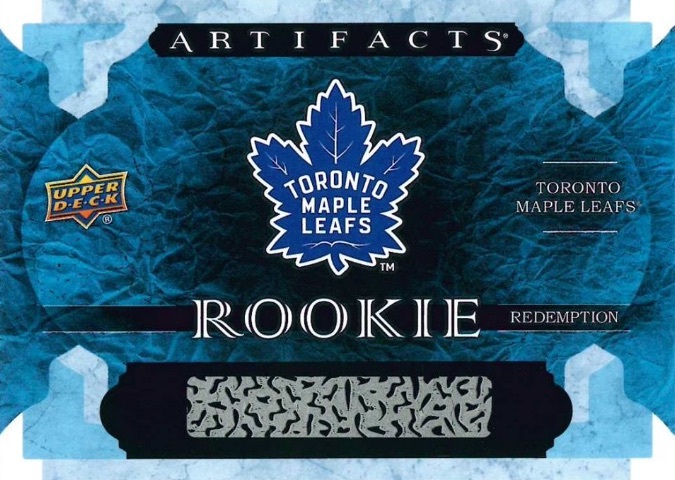 Has anyone heard when they’re going to start release names for the rookie redemption list? Thinking there are some that are obvious, but more interested in the I-V auto/jersey redemptions. This is somewhat a hit or miss product in my opinion. The cards look great, I really like the foil and high end look of the cards, although I don’t like how they only give you 8 packs. I don’t know if it’s just me, but I would way rather get a patch or autograph card rather than their new aurum cards. Don’t get me wrong, the aurum cards look nice, but their not even numbered and it still shouldn’t count as a hit. I really wish they would still gauruntee an autograph card per box. 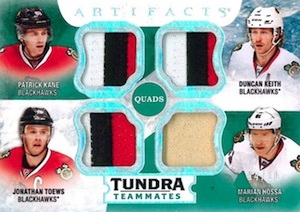 Overall I think it’s a fun product, but in my opinion, 2014-2015 artifacts has a better value than 15-16 and 16-17. 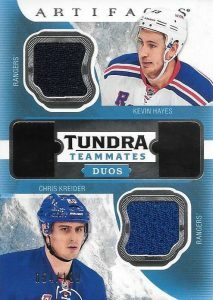 Three inner case team breaks in so far with the Rangers and loving the great cards that I’ve pulled so far (including my first one of one)… starting to get some patch duplicates now so maybe I stop after the next one??? Who knows, but I love the product! I’d consider this product a huge step in the right direction based off UD’s 15-16. I wasn’t crazy about this product at first but the more videos I watch the more I wanted to try it even tho I’m saving my money for Series 1. I’ve gone to my LCS a couple of times just for loose packs and I’ve pulled some nice relics and a rookie redemption. 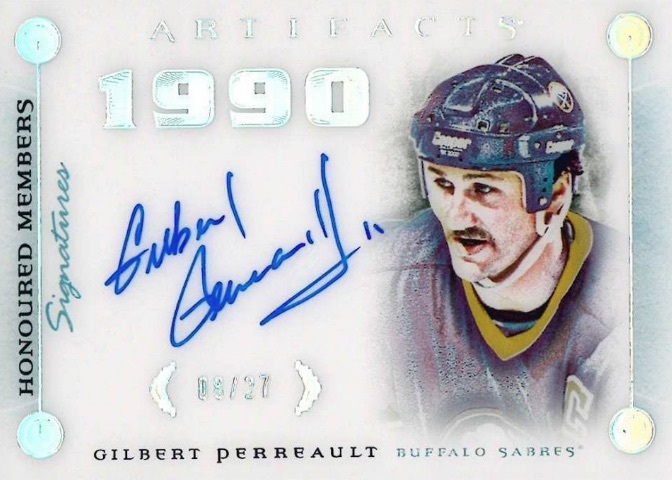 Went back today for a couple more and pulled a Doug gilmour honoured members signature. Really looking forward to the products UD has coming this year and it seems like they’re even lowering the prices as well. Glad to see they’re listening to us. Hello, just wanted to say this is a great product. I pulled a patch auto emerald of rookie number 3,any idea when the list will be released? 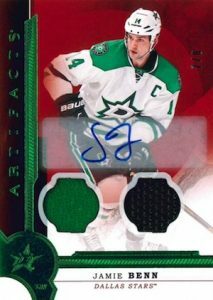 Bought 4 box artifacts 2016 for $90 cdn each. Got 9 rookie redemptions, including 1, 4, 5 picks, a rookie jersey patch auto and much more. This felt like a better purchase than 3bx of ud s1@ $99 cdn each. UD on the rookie redemption cards… “the set will be built after the start of the season.” Um it’s February now. It’s been 3 1/2 months now since I redeemed my card. Wow! 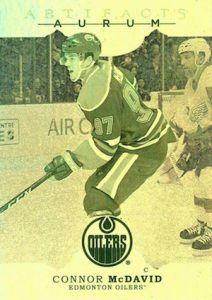 UD on the rookie redemption cards� �the set will be built after the start of the season…more like “sometime after the playoffs or whenever we feel like it sucka”. I have since moved my hobby budget to sports memorabilia. Why buy $100’s of $$$$$ on wax boxes, when you can get an an Auston Matthews puck auto for $90 on NHL.com? I agree with Lars And Northside. Not only has the 2016-17 Season started, it has come and gone. The 2017-18 season has started and I am still waiting for my 2016-17 redemption. 2016-17 Upper Deck Artifacts Factory Sealed Hobby Box Auston Matthews RC ? 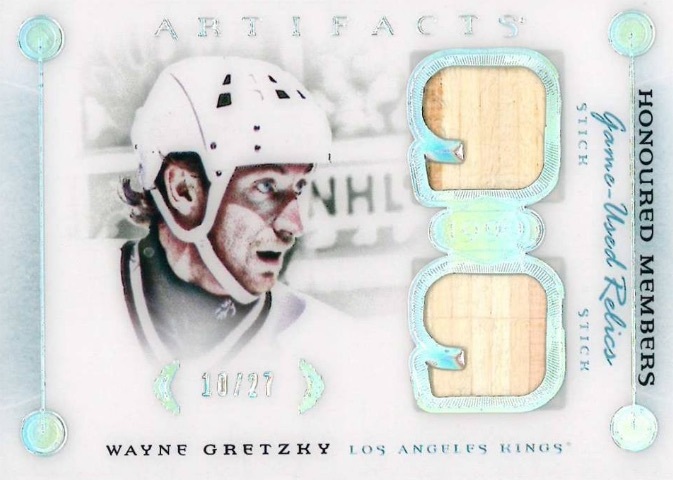 2016 17 Upper Deck Artifacts Hockey Sealed 20 box Hobby case! Matthews!